Welcome to the home that Uncle Sam threw up on. I started a little late in my 4th Of July decorating, but once I started, I had a hard time stopping. 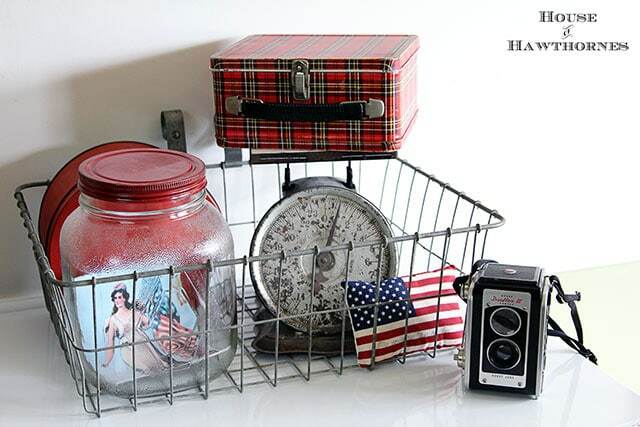 and on the cabinet I created a 4th Of July vignette using a wire basket and a vintage scale. The glass jar has a vintage 4th Of July postcard image in it. One of my favorite ways to create INEXPENSIVE holiday decor is to print out vintage postcard images and place them around the house. Easy, peasy and quick! You can find additional postcard images you can print out at my 4th Of July Vintage Postcard Printables page. 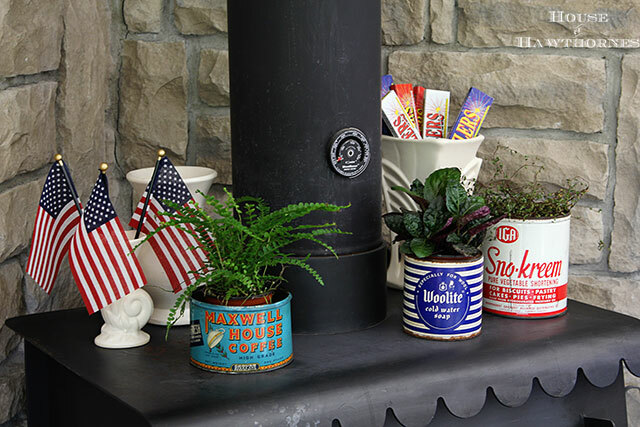 More flags are placed in a white ironstone vase and the Woolite and Sno-Kreem (shortening) tins make a easy pop of patriotic color! 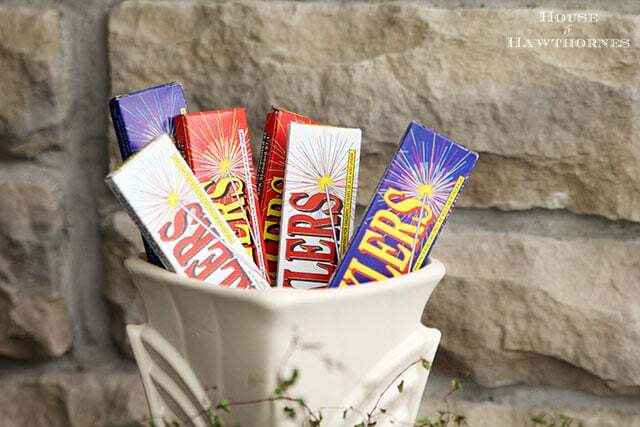 And let’s not forget my hands down, favorite 4th Of July decor item – SPARKLERS! They’re cheap plus I keep the boxes from year to year, so I always have some to toss in a vase or throw on a table for INSTANT 4th Of July decor! 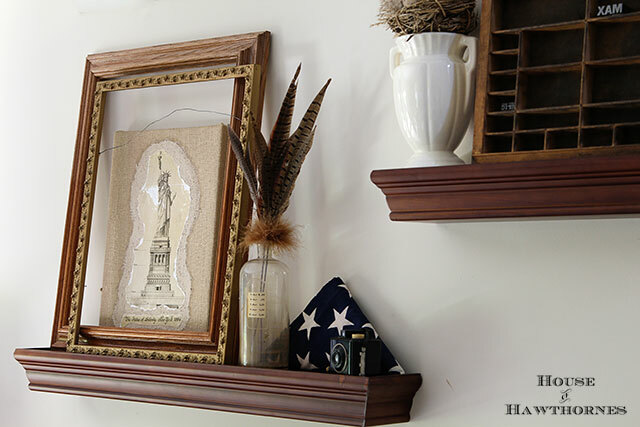 A folded flag on a shelf along with an old Statue Of Liberty print add to the patriotic theme. 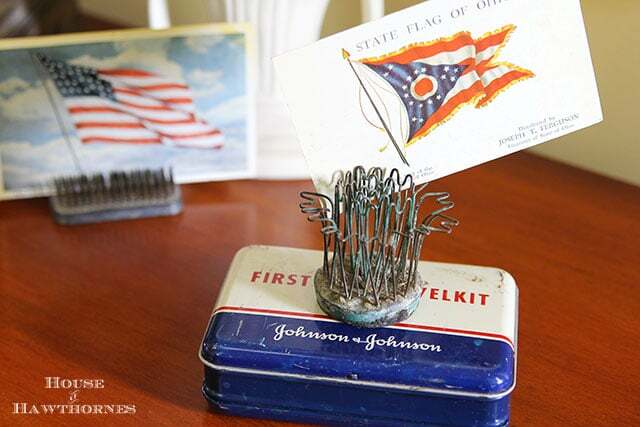 I even use little flag toothpicks to add some festive decor here and there. More flags and some more patriotic postcards grace the entryway table. OK, now the first aid kit doesn’t shout 4th Of July (unless you’re using it to bandage up after the fireworks accident), but it is red, white and blue. And of course, I had to add some flags to my summertime front porch. You just can not go all red, white and blue inside and not do it on the outside! Do you have any plans for the weekend? Or are you staying home and relaxing like we are? I’m loving all your red white and blue Pam, you always do such a great job with your vignettes. How’s your son’s baseball going? I think I read that he was on a team this summer right? My son’s getting ready to go back to Camp Rec again. He loves it, can’t wait to find out who is camper will be. He loves it! He’s met a lot of other kiddos and we’ve gotten to meet a lot more parents of kids with disabilities. So I think it was a good decision to do it this year. Loved the vignettes! Had to pin! 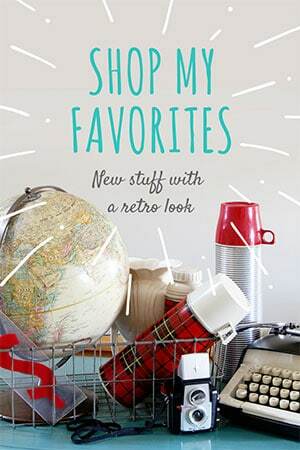 I’m loving all your vintage tins and coolers and plaid thermoses! They pair so well with stars and stripes. Speaking of, I like the way you’ve hung your flag on your house. It beats going outside daily (in the rain) and unwinding my flag that’s wrapped around the pole! And look at your black-eyed-susan vine already! You are at least a month ahead of us in the growing season. Happy 4th! I got tired of pulling it down off the roof last year. We had it hanging on the very front of the front porch then and every ten minutes I’d have to get the ladder out and flip it back down and then a few minutes later it would blow back up there. Much less trouble to just hang it right on the house. Everything looks festive for the fourth. 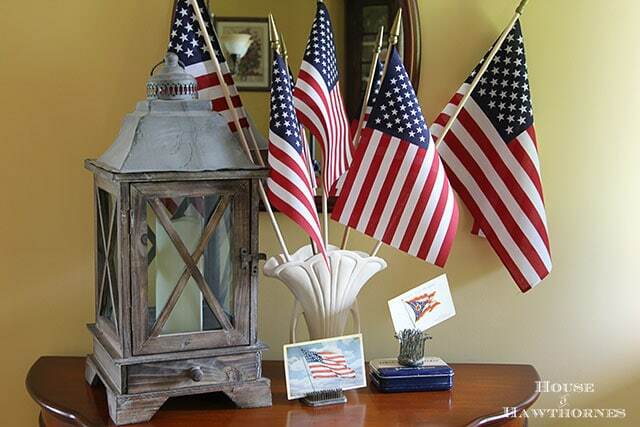 Next year if you want the red, white and blue to last long start your decorating for Memorial Day too. 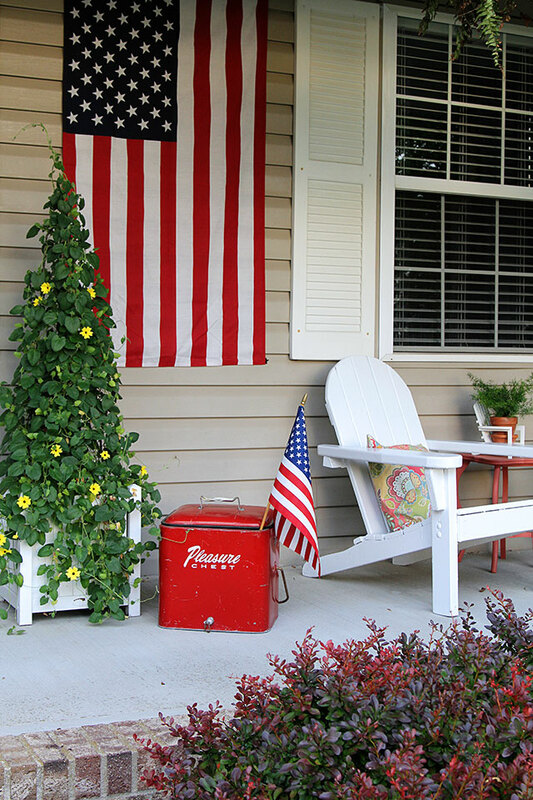 The house looks ready for a patriotic party… so fun! and your front porch looks as inviting as a tall glass of lemonade on a hot day… pretty and refreshing! You decorate in the vintage style that I love! I’m going to have to pin many of your photos so I’ll have some new decorating ideas for the 4th next year. OOhhh you back up to a cornfield too???? I love the vintage side of your red, white and blue!!! Don’t pack it up too quickly….Labor Day is just around the corner! Love that Buddy L truck. I really need to find one that doesn’t cost a million dollars and is being sold by some old guy at the flea market who I see at the thrift store ALL THE TIME digging through the toys as if they were all made of gold. It took me a good half a day to get out and display all of my 4th decorations. But I keep mine out throughout the Summer so all the hard work doesn’t seem to go to waste, especially since I just got them all out last week. Have a great 4th, Pam! Love it! Tool box purses?? I think they will be a hit. Have a wonderful and safe 4th. 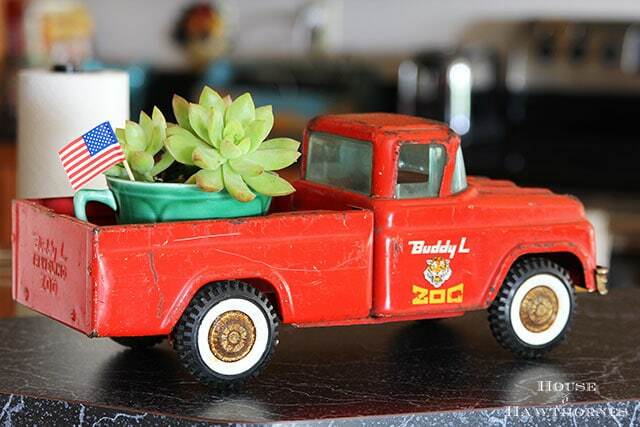 Love that little truck with the succulent & flag!! 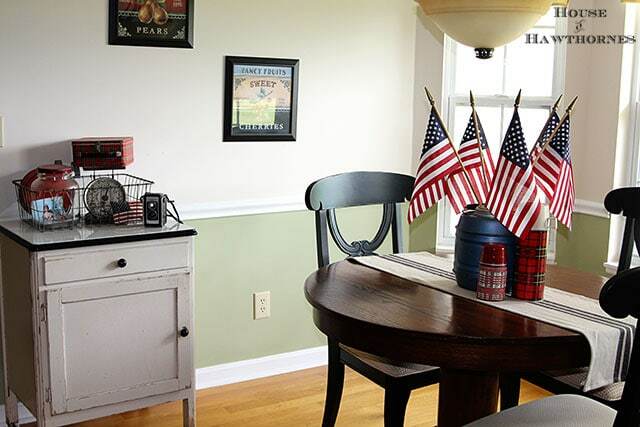 What a great assortment of patriotic decor!! Love it – and I’m Canadian! Ha! So adorable, Pam! I did absolutely nothing inside other than the kitchen table because I’ve been working on our deck and plants! 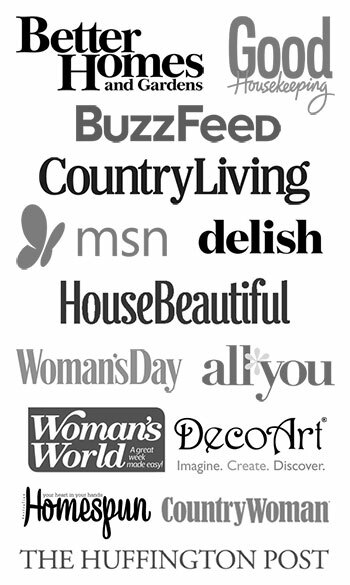 Your home look wonderful! Love how you incorporated the thermoses! It’s all fabulous! Lots of fun inspiration with all your vignettes. Everything looks fab. Loved seeing the cornfield in your backyard! Your home is always so clean and tidy to me. I have things going on everywhere that you look. Happy 4th! We’ll be home taking it easy! What’s growing up your topiary? I loved the tour of your red/white and blue. Loving the way you put your collections together – so clever! Happy fourth! I love the displays! They all look lovely! Your porch looks great too. I am inspired! 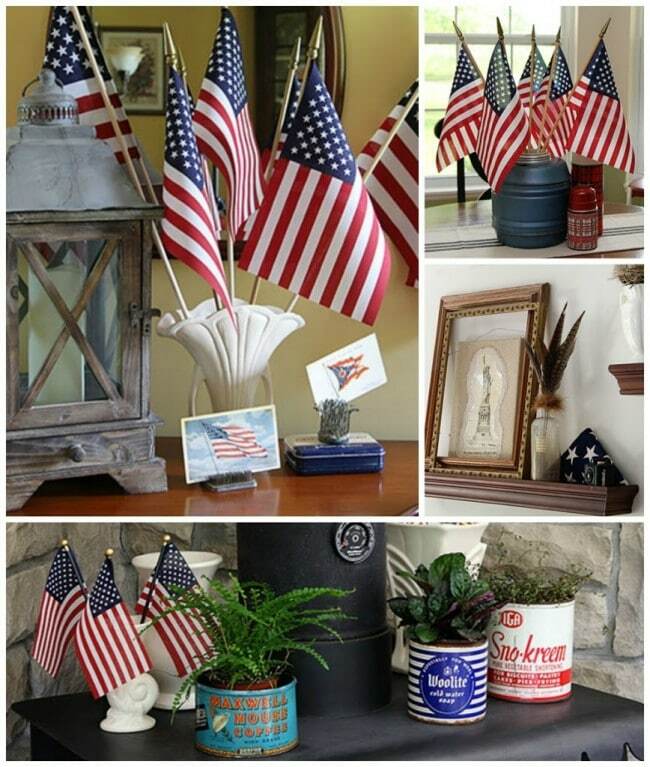 This is all so pretty, Pam…love all of the thermoses and flags!